I haven’t blogged in a couple weeks – decided I’d tell all about my visit to Colorado to see Lindsey. I should go ahead & tell you that this post is probably gonna get pretty funny. Why? I mean, it is about Lindsey & I. What more do you expect? I flew out of Jackson on Friday the 22nd & that was an accomplishment in & of itself. 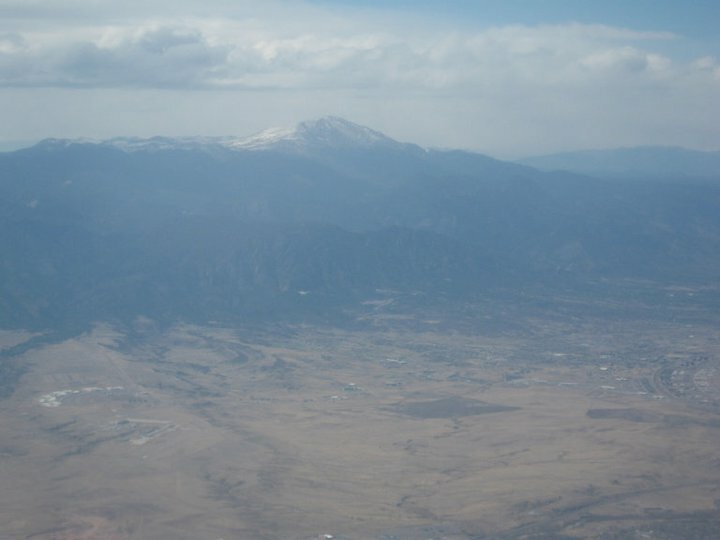 About 5 years ago, we were on a plane leaving Colorado Springs & the plane hit an air pocket (or something) & decided to drop a couple hundred feet. Well – cue my flight anxiety. We are talking sweaty palms, heart palpitations, full blown panic attack on an airplane. And if it hit even the smallest bump – hello death grip on the arm rest. I can white knuckle the button slap off an airplane arm rest if the plane hits turbulence. But more on that later. I made it through both of my flights courtesy of a lovely drug called Lorazepam. Look it up – it’s fun stuff. Again – we’ll get back to that. Lindsey was so excited to see me, she literally skipped the stairs & ran down the hill. Wow. Make a girl feel special. 🙂 Don’t believe me? Look on Facebook. I uploaded a picture. I’m not gonna lie – I was beyond thrilled to see her but the altitude in the Springs prevented me from running up the hill to her. I would have probably collapsed from oxygen deprivation & no one wants that. After a joyous reunion, there was a delicious supper at Saltgrass & then we got to explore our Easter Bunny treats – two days early! We also watched the movie “Date Night” which left us with many quotable phrases that we uttered throughout the rest of the weekend. A personal favorite? “He turned the gun sideways – it’s a kill shot!! !” You had to say these phrases in character too – you didn’t just mutter them randomly, they had to be screeched with conviction. Why was that phrase so great? I dunno. It isn’t like we ran into armed gunmen while roaming the Springs. Again – this is Lindsey & I. As my lovely mother says “ya’ll aren’t right”. Indeed. We aren’t. We did a little shopping on Saturday morning but there is really nothing that exciting about shopping. At least there really wasn’t this time around – I mean, I’m sure Lindsey was psyched about her new dress, shorts & tank & I am pretty thrilled with my Superman shirt (I’m wearing it now) – but that was really it on the shopping front. The best part of Saturday? The Cheyenne Mountain Zoo, of course. It was great, but most importantly because I learned something very interesting about my little sister. Beware – I am fierce. ﻿ See the small creature on the right? 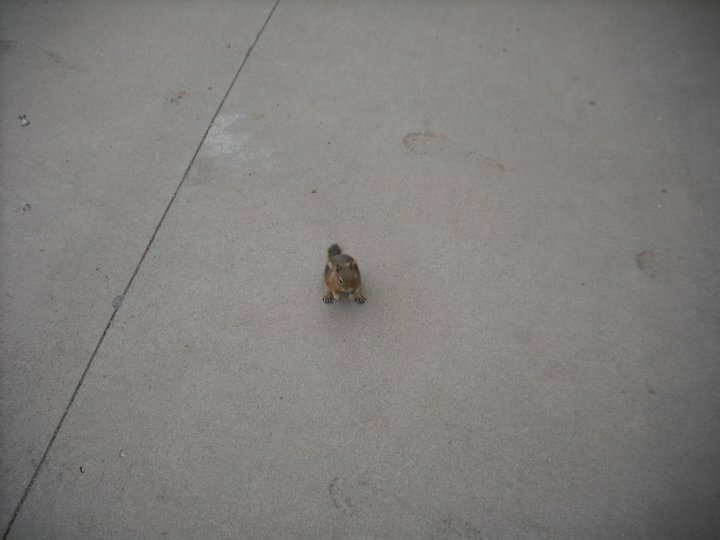 It’s a chipmunk. They were everywhere at the zoo & they were absolutely precious! This little guy decided he wanted to get to know us better – Lindsey was talking to him & he kept creeping closer & closer – which I thought was awesome. I should tell you, this chipmunk might have weighed all of a pound. It wasn’t even a fat chipmunk. As we talked & the chipmunk came closer, I was excited. How close would it come? Well – not so close when someone shrieks at you. The chipmunk obviously got too close for Lindsey’s comfort & she shrieked, at which point the chipmunk dashed in the opposite direction. I just looked at Lindsey with a puzzled expression & said “Lindsey – it’s a chipmunk”. Her response? “Yes, but those things can be fierce”. Are. You. Kidding. Me? She wants to fly fighter jets. She wants to pull upwards of 4G’s (I think that is right….) come close to breaking the sound barrier & do aileron rolls but chipmunks are an issue of concern? Who are you?? You constantly blow my mind & that is awesome – but chipmunks? I think I have seen it all. Speaking of things that are fierce – the picture to the left. 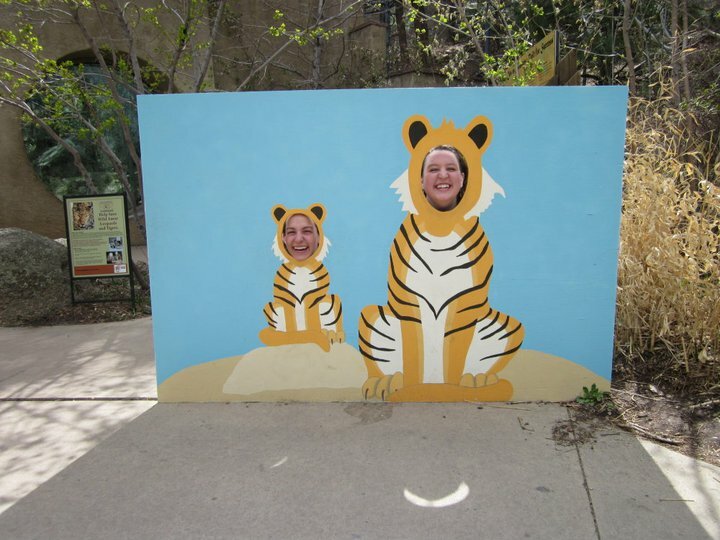 Reason #5,329 out of too many to count that Lindsey & I are awesome. Want to know something else awesome? I brought home a framed version of this for my parents as their gift from the trip – I’m pretty sure it is one of the greatest pictures ever. After careful consideration, it is now my profile pic on Facebook. I love it that much. Lindsey & I told Jeff & Ging that they needed to place it front & center in their new home in VA so that when they make new friends, they can use this picture to brag on their children. I’m not sure they bought it so much…. The rest of Saturday was lovely. I got to meet Lindsey’s sponser family, the Gaydons. Halting the goofy recap for a minute, I am so thankful for these people & I barely know them. They have taken Lindsey in & they love her like she is one of their own. She is so far away from us & it us such a blessing knowing that there are such wonderful people in the world who will take someone else’s kid (or kid sister in my case) & care for her. Anway – after meeting the Gaydons, we ate at Noodles & Co which is absolutely awesome. We also saw the movie “Water for Elephants” which is something else that is awesome. And not just because Robert Pattinson is in it. Although that defintely doesn’t hurt at all. He looks much better with a tan – he’s pretty epic as Edward Cullen, but vampires are awfully pale. Just sayin. Also just sayin – go see “Water for Elephants”. Good way to spend two hours & roughly $8. Lindsey & I spent our Sunday morning at one of the most wonderful places on Earth. If Disney World is the happiest place on Earth, then the Broadmoor is getting pretty close to second place. They have a Sunday brunch that is to die for. Of course, it will also make you die a little when you get the check – but oh well, it was all worth it in the end. They have more food than you could ever imagine & it is all so delicious. At least, all that I tasted was. I had (get ready, there is a lot of stuff & I’m not even ashamed) – maple cured bacon, Irish breakfast potatoes, a waffle with grand marnier sauce, strawberries, blueberries, kiwi, pineapple, raspberries, a cheese blintz with berry sauce, beef tenderloin tips, grilled chicken, ham, mashed potatoes, bread with hummus spread, bread with garlic spread, a miniature rabbit cupcake (not filled with actual rabbit but it did have mousse in it) peanut butter pie, carrot cake bite, chocolate mousse bite, chamomile tea jello with fruit. Yep. I think that it all. I may be wrong though. I may have blacked out at some point because of the awesomeness of it all. There was so much more to choose from. 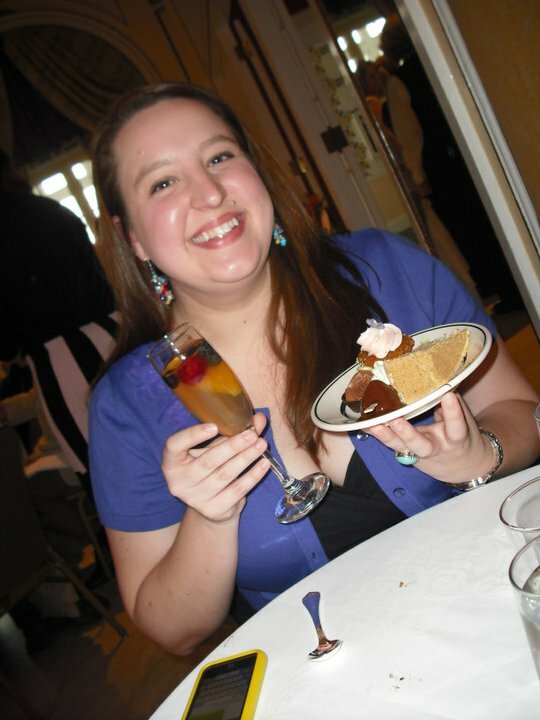 Lindsey ate a whole other variety of things because it was just all so delicious & wonderful. We wandered around the Broadmoor afterward & Lindsey decided pretty quickly that while her high heels looked fierce, they felt fierce too. I’ve learned that lesson several times myself. Not cool. Suddenly my words want to center align while I am typing this & so I am just going to continue on writing. I hung out with Lindsey for the rest of the afternoon & after a splendid visit to Wal Mart & some wonderful supper at Cheddars, I had to deposit Lindsey back at USAFA. I wasn’t too sad yet though because I knew I would see her one more time Monday morning. Little did I know. Oh how little did I know. Lindsey & I hung out together in Arnold Hall on Monday morning & then I was off to the airport – where I waited, waited, waited to board my flight for Dallas. The flight that was supposed to leave at 1:45 but I didn’t board until 2:20. I then sat on the plane for 30 minutes because there was a lightning warning in Colorado Springs & they couldn’t refuel the plane. Guess what happened after they got the plane refueled? They informed us that our plane had been delayed by about 3 hours because of storms in Dallas. We could get off the plane or stay on for the wait – it was up to us. Who would sit on an airplane for 3 hours if you didn’t have to? Well – Lindsey might now that I think about it. Not me. I booked it back up that aisle & hopped off. The adventure was just beginning from here. I got in the line to see if I could be rerouted through anothe airport but it was not meant to be. The lovely lady (and I mean that, not being sarcastic, promise) told me that I could hang out at the airport until the flight to Dallas left, but my flight from Dallas to Jackson was cancelled so I’d have to find a room & hope to get on a flight as stand-by on Tuesday. My other option was to stay in Colorado Springs for the night, fly out on Tuesday morning at 10:05 to Dallas & then leave from Dallas going to Jackson at 4:30. So – option one is to hang out in Dallas, alone & option two is to get to hang out with Lindsey some more? Ding! Ding! Ding! Can you guess what option I took? I got my new tickets, rented another car, booked another night at the Rampart Lodge & text Lindsey to tell her that I was headed back her way & what did she want for supper. I was stressed out & yet thrilled at the same time. 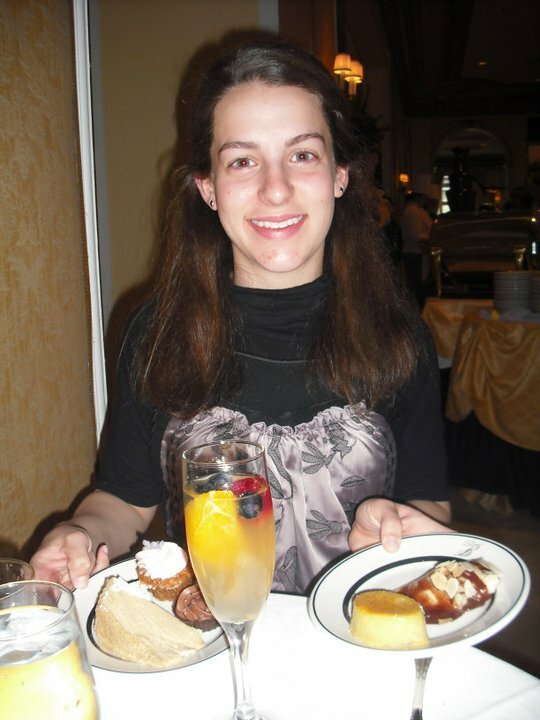 I got to spend another good 4 hours with Lindsey on Monday night – we ate supper together in Arnold Hall, went to her dorm room, did homework in Fairchild Hall (well, she did homework, I read about the Royal Wedding). It was great. Tuesday – well, it was just eh. My flight from Colorado Springs to Dallas was fine but oh Lordy gracious – don’t even get me started on the flight from Dallas to Jackson. There couldn’t have been more turbulence if the Lord had put the plane into a blender & then shook it as hard as he could. I had taken my Lorazepam & if I hadn’t, it would have been all over. As it was, I was hanging on to that arm rest for all I was worth. An Idiot Abroad had lost all appeal to me & I could only hang on for dear life. I was so happy to see solid ground & my Momma. Oh – and the cupcake box from Gigi’s. I had one of the best times spending those days with Lindsey & I’d do it again in a heartbeat…or two. I am still recovering from the flight from Hades. Give me another week or two though & I’d be ready to go again. I love that kid so much it is mind-blowing & I can’t wait to see her again, even if it means bouncing my way through the not so friendly skies to get there. Side note – today was the Royal Wedding. Absolutely amazing. This picture has to be my favorite out of all the pictures I saw of coverage today. I mean – really sir? I’m not entirely sure what is going on in this picture, but I love it. 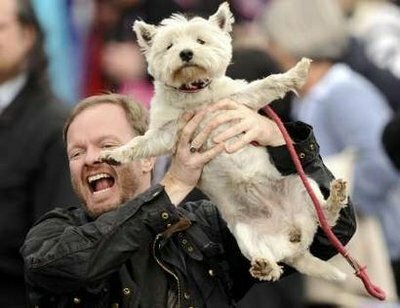 Is this Brit waving his little dog in the air in jubilation over the nuptials of The Duke & Duchess of Cambridge? Is he trying to make sure his dog sees the carriage as Wills & Kate (oops, Catherine now) pass? I’m really pretty sure that the dog could care less. He doesn’t look so thrilled about being used as a banner. Yay for Wills & Catherine – now put down the pooch & continue to celebrate without scarring your dog for life. And Back in the Dark Ages…. This morning I was chillin at my desk, enrolling someone for some insurance & talking to my co-worker. We were discussing all the drama that teenagers get into every day & I said “I don’t even want to imagine the kind of drama that my life would have had if Facebook had existed when I was in high school”. Which really got me thinking about two things: 1) All the stuff that kids born these days (we’ll say 2010 & on) will never know about & 2) All the stuff that they know about & couldn’t imagine living without. -They will have no clue what a VHS tape is. A movie used to be one of these honking big things & now it is a teeny little disc. If I’m really honest, some of them may not ever even know what a DVD is because Blu-Ray is quickly becoming the more popular option – the picture is so crisp & bright! I know this because we rented a Blu-Ray to try out in our fancy DVD/Blu-Ray player & all 4 (yes 4, Lindsey was at home visiting) stood around & gazed in awe at the picture quality, making remarks like “oh wow, so crisp” & “that picture is so real & bright”. Now you can click a button & pick what chapter of the movie you were on. You used to have to rewind the thing. And it took forever. And it made you have patience. Now you click a button. -They will have no clue what good cartoons are. Now, maybe this is totally a random judgement call, but the commercials for cartoons that I see now…they look like total bunk. What in the world is Toonzai? What is a Dragon Ball Z? What is Bakugan? It all just looks like weirdness to me. I remember the good stuff – Captain Planet, Teenage Mutant Ninja Turtles (which may still come on…not sure) & especially Santo Bugito. Santo Bugito was one of the best cartoons ever & myself & my friend Ashley may have been the only people that ever watched it. The commercials I see for this new stuff look really violent & strange. What ever happened to cartoons where normal looking people saved the planet? -They will never know that going to the movies didn’t always cost an arm, a leg & maybe your right kidney. And that’s just for the ticket…don’t even get me started on drinks, popcorn & candy. -They will never know about snail mail. I used to send letters to my friends that live in far away states. I had to take the time to sit down & write out the things I wanted to tell my friend & then wait to get a response. Not that I don’t love the ease & convenience of email & texting, but there is just something that is thoughtful about a hand written letter. It shows that you took time. I like that. And kids these days have no clue. Life is all about faster. -Facebook…or MySpace…or whatever other social networking sights there are out there. I am a Facebook person myself. I myself didn’t even know what Facebook was 5 years ago & now it is so important to my daily life that I have an app on my phone that lets me check Facebook whenever I want to. Facebook is amazing for keeping up with people that you don’t get to see as often as you like, but I feel pretty confident that there are lots of downsides to it too. Like I mentioned above – I don’t think I led that dramatic of a life as a high school kid & yet there was always drama in some form. I can’t imagine how much more ridiculous & blown out of proportion things could have gotten in Facebook was around when I was in high school. Teenagers need no help creating drama. And just think – if you just had a kid, there will be Facebook (or possibly something even more advanced & space agey) for them to poke around on when they grow up. -Cell phones. I remember when cell phones looked like the honking thing on the left of the page. And now, it is all about making them smaller, cuter & able to do just about everything. 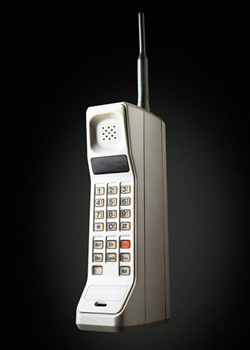 A cell phone used to be a phone. Just a phone. Now, a cell phone is so much more than that. Heck – on my phone alone I can – take pictures, watch YouTube videos, surf the web, watch TV shows, listen to music, buy music, check the weather, contact AAA, book a flight, find the cheapest gas prices, look up recipes, make & send postcards, read the Bible, play games, check & send email….I mean, whoa. I’m not even mentioning the fact that I can also just talk to people on the phone. Because it is a phone after all. And these days, there are seven year olds who know how to work my phone better than me. Seriously. There is no chance that kids that were born after about 2005 don’t know how to work a cell phone like a champ. They will never not know what cell phones are. Wow. – A lot of kids today (not me though, although at 26, I’m really not a kid) couldn’t live without DVR. A lot of adults couldn’t live without it either. I hear that DVR is an absolutely wonderful invention that lets you record, pause, rewind & fast forward live TV. I remember the long ago time when you were going to miss your favorite show you had to put a VHS (remember those things?) in a VCR (what is that?) and record it. Now – just set that DVR to take care of it. I want one of these things. -A GPS. Lord knows that those things are awesome. Today you can’t get from point A to point B without one. I’m pretty sure that if you polled kids & asked them what MapQuest was, they would have no clue. I remember when you had to Google directions so that you could get somewhere. They usually worked out just fine. I mean – not to brag or anything – I got my Mom & I around the entire island of Oahu without a GPS. That is pretty amazing because every single road has some kind of Mele Kala Like something in the name. I bet no lots of kids think that you can’t get across the street without a GPS. Well…you can. :)That being said – I still really love Carla, our GPS. Especially when I set the voice to Mister Midnight & he randomly says things like “There is a full moon out tonight – be on the lookout for werewolves” or “Do you hear that rattling in the trunk?” Priceless. Who knows what kind of things they will invent in the next 5 years…in just the next year? A lot of kids aren’t going to know what it means to live without an iPad. Technology is mind blowing & makes life (most often) a lot easier but sometimes I think about what it must have been like even before I was born. When people didn’t have a TV in every room, or even a TV in the house…when people didn’t have cell phones that distracted them from talking to the actual person in front of them…when people couldn’t fire off a quick email as a hello. I love my TV – I am far too addicted to about 5 or 6 different shows – I couldn’t live without my cell phone & I love the convenience of sending email. But I sometimes wonder if it might not have been nicer when life was a little more simple. That’s just me though.